There is rarely a dull moment in our lives with acres and animals. Yesterday was a particularly full day. 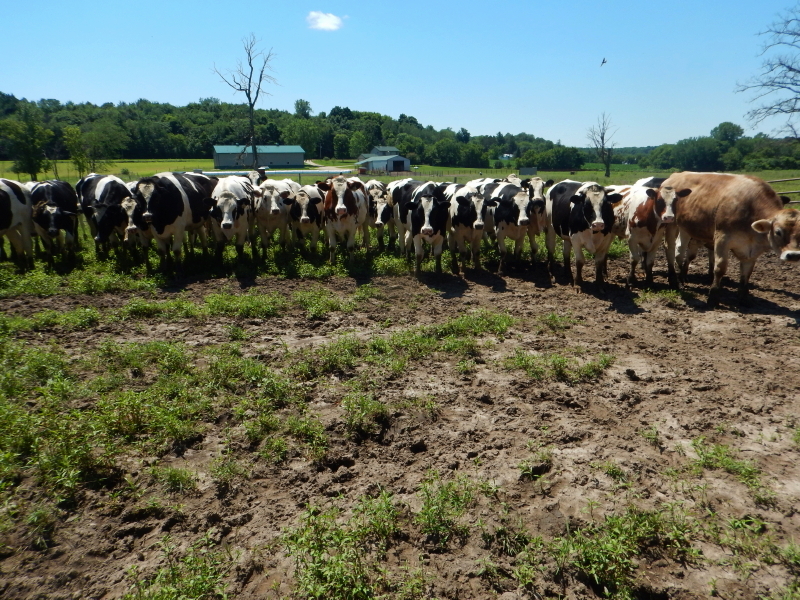 Before I get to that however, I really must post more pictures from our great cow adventure last Friday. These belong with Saturday’s post, but I was up at the lake, and just didn’t have the bandwidth to support my intentions. I didn’t want them to get any ideas about joining the remaining escapees, so I worked to convince them they’d be happier going the other direction. It was a hard sell. The second wire from the top was the only broken one, but holding them open provided plenty of clearance, if only the overly cautious (now they decided to be cautious!) bovine would step through. After a busy morning at the lake yesterday, tending to minor chores before heading home, we traveled in Cyndie’s car with the top down in the beautiful sunshine, joining a LOT of other vacationers for the trek home. It was as if our full day had barely gotten started. 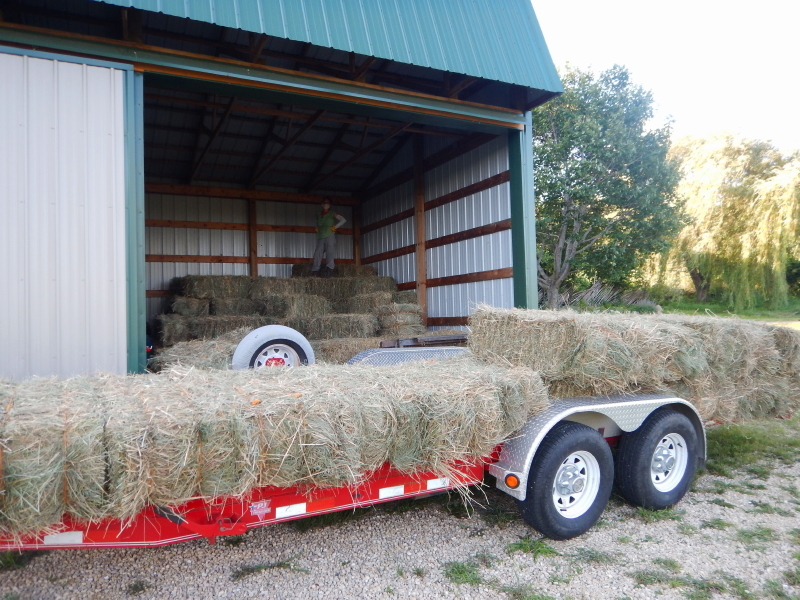 I was able to connect with our next-door neighbor to borrow his large trailer for hauling hay. Our first source of bales reported a shortage of availability, due to a new client who required 4000 bales. Five minutes after that sorry news, he called back to say his brother had bales we could buy, but needed to get them out of the wagon by the end of the day. Cyndie whipped up an early dinner and then we set off to begin this summer’s hay bale escapades, the first of multiple expected trips. Thankfully, due to our previous experience, the loading and transport went smoothly, and we got the load stowed in the shed while there was still daylight. 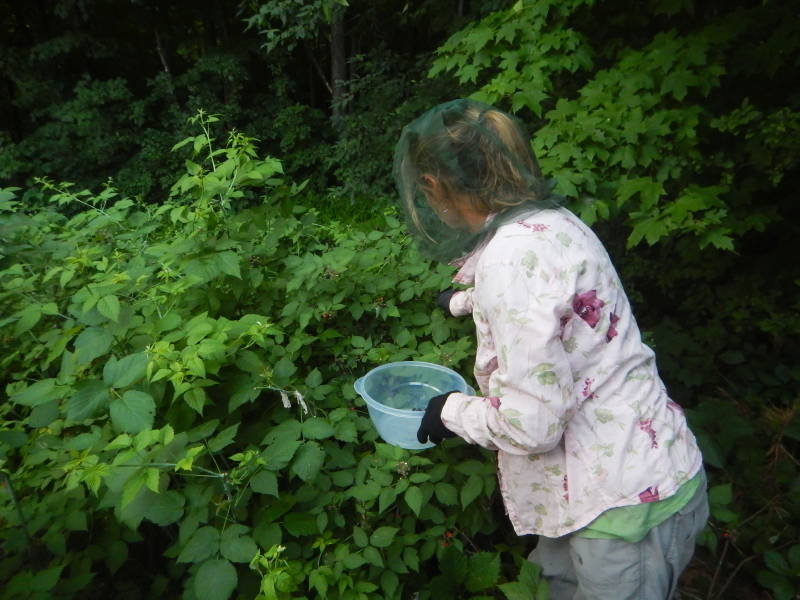 As the last light faded, I found Cyndie out picking black raspberries because there are still so many berries ripening. From inside the house, I heard branches breaking in the woods. I called out the window to Cyndie and she said she was hearing it, too, but didn’t see anything. She prolonged her berry picking to see if that last stray cow from Friday still might be roaming around, but neither a deer nor a cow materialized before she quit to go secure the chicken coop for the night. We are happy to report, all twelve birds were safely inside. Some days we count our blessings in terms of the number of potential catastrophes that haven’t happened. Yesterday, in terms of all the things that could go wrong, none of them did. On the other hand, nothing spectacular happened, either. It was just another day, which is its own sweet blessing of good fortune. We feel awash in love from all of you who have been sending energy to us since the day in January when Legacy came to the end of his time with us. It’s hard to tell if we are waiting for something to happen, or simply living what is supposed to happen. Is this it? Is this what our life in the country is all about? Are we living in the moment, giving and receiving everything possible? It would mean a lot to us if we were to discover we are paying good fortune forward to the universe. The rabbits, squirrels, and song birds seem to be happy enough with having survived another winter. 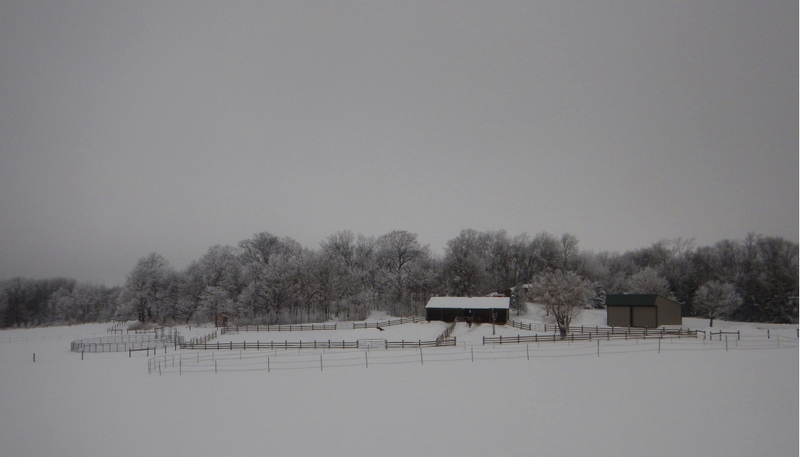 We’ll have to wait for the ground to thaw before we find out if the flora of our property did as well as the critters. Personally, I wouldn’t mind pulling a Rip Van Winkle until the growing season starts. I’m tired. Wake me when the grass needs to be mowed. Ah, but it is my good fortune that such thinking is just for fantasy. 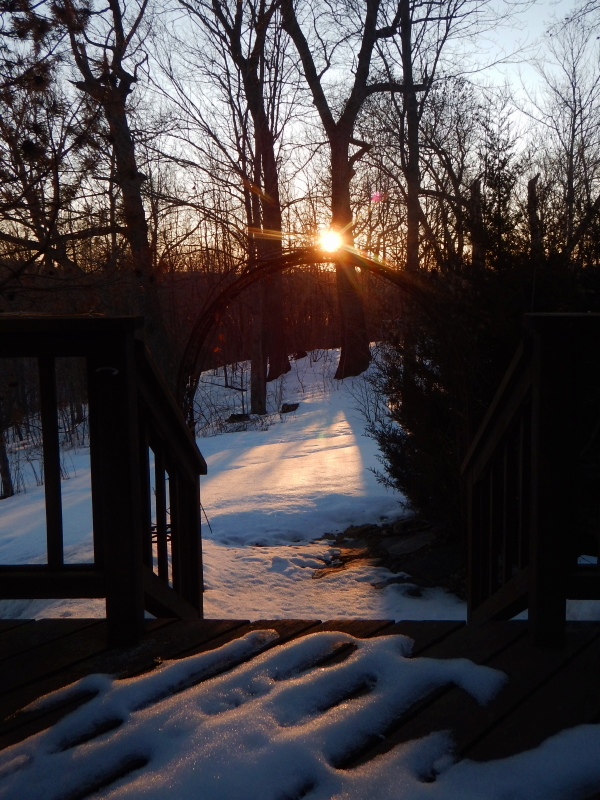 The truth is, there is something in every single late winter day to enjoy, like the light across the melting snow in the minutes before the sun drops below the horizon. I wouldn’t want to miss it, even if it involves days that are otherwise unspectacular. 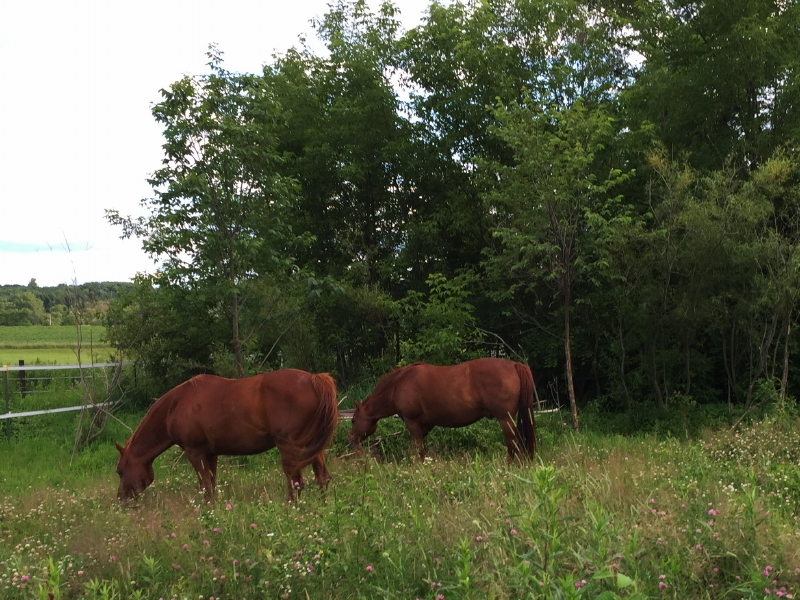 Yesterday afternoon, I was walking from the shop toward the barn on one of my favorite paths when I felt a wave of heightened appreciation for the daily adventures we enjoy as a result of Cyndie’s and my decision to move to the country and become horse owners. After feeding the horses and cleaning up under the overhang, I lingered among them for an extended visit. They each took turns approaching me for some physical contact. Dezirea was the most persistent about moving in so close that I had to watch my feet to keep my toes out from under her front hooves. They all wanted scratches, each in their own special spots. They spend a lot of time all day long trying to fend off bugs and I imagine the lack of having a hand to swat and scratch must make it a real chore. They swing their heads, stomp their feet, and snap their tails, but none of that is the same as a good scratching with a hand that can reach all the difficult spots. Hunter tends to favor his chest and neck, Dezirea definitely prefers the middle of her back, Legacy has lately accepted head scratches, and Cayenne will take anything we offer. It is a thrill and a privilege to have the adventures of horse ownership available to us every day.